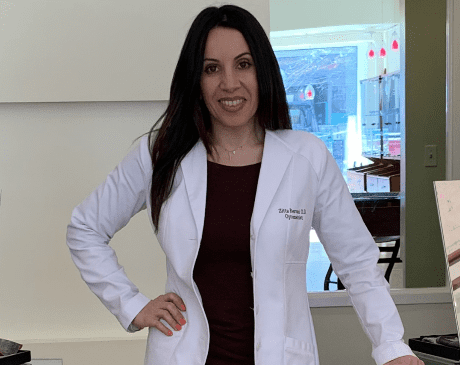 Dr. Zitta Rezvani is the primary eye care provider at idoc optical. She grew up in Arlington, Virginia, but after several moves, her family settled in Kentucky. Her fond memories and love for diversity brought her back to the greater Washington, D.C., area. Dr. Rezvani chose the profession of optometry as a way to serve others. She received her undergraduate degree in biology from the University of Louisville. She then completed a second bachelor’s degree and her doctorate at Illinois College of Optometry in Chicago. Dr. Rezvani has traveled extensively with VOSH (Volunteers of Optometry in Service for Humanity) and the Lions Club to several developing countries to provide eye care and glasses. She has also been involved with several local projects performing eye exams for some local children in a moving clinic in D.C. She has also worked very closely with the Boys and Girls Club, Washington, D.C. chapter. Dr. Rezvani believes in a preventive and holistic approach to eye care and specializes in the treatment and management of difficult-to-fit contact lenses and designs specialty contact lenses for each patient’s individual visual needs. She not only provides thorough and efficient eye exams from start to finish but is also involved with all aspects of the practice. She personally selects all of the frames in the boutique, greets patients, and even offers assistance when her patients are selecting frames.